Today’s breed of Halloween-themed attractions grows more terrifying every year, making the haunted hayrides of bygone eras look like tea parties in comparison. This year is no exception, as many venues have upped the fright factor with freaky new themes (bloodthirsty humanoid centipedes, anyone? ), mazes designed for solo exploration, and more serial killer clowns than you can shake a scythe at. Nobody seems scared off; in fact, brave souls are flocking to these Halloween attractions in such high numbers that many parks have added a fast-pass ticketing option that allows visitors to bypass the lines. Here are our picks for the scariest Halloween attractions in 2012. Check them out – if you dare. Open for just a few years, this haunted attraction, which is housed at a former psychiatric hospital that local paranormal teams claim is one of Toronto’s most haunted sites, has already scared plenty of visitors silly. Attractions play on people’s worst fears – such as “Buried Alive,” in which only the bravest of thrill-seekers lay inside a closed coffin for as long as they can last – that stick with visitors long after they’ve gone home. The only thing that may perhaps calm your rattled nerves? Knowing that a portion of all proceeds go to charity. Tickets start at $12 online; advance purchase is encouraged, as the event is expected to sell out. Halloween Haunt, Knott's Berry Farm, Buena Park, Calif. In its 40th year, Knott’s Berry Farm has amped up the scare factor at its Halloween Haunt event to terrifying new levels. The newest addition is called Trapped, an interactive maze that, for $60, takes up to six brave souls through a labyrinth of locked rooms with freaky scenarios that they must try to escape. Reservations are required for Trapped, which is one of 13 mazes, four “scare zones,” and nine live shows that make up the park’s Halloween Haunt attraction. Whatever option you choose, be prepared to leave with your nerves in all kinds of (pardon the pun) Knotts. The Bates Motel & Haunted Hayride, Glen Mills, Penn. For nearly 20 years, this attraction just outside Philadelphia has been proudly freaking out guests. Take your pick of three terrifying options: the Bates Motel haunted house, the Haunted Hayride, and the Haunted Corn Maze, the latter taking place in the creepy woods and corn fields of the property’s Arasapha Farm. The hayride features 75 actors and 25 spine-tingling scenes, with a new drive-through slaughterhouse added this year. Adult weekday tickets start at $30 and discounts are available for combo and group passes; the attraction is open through Nov. 4. Everything is bigger in Texas, so it’s no surprise that this sprawling, 235,000-square-foot facility in Fort Worth earned Guinness Book of World Records honors as the World’s Largest Haunted House in 2009. The scares are just as enormous during a bone-chilling, hour-long walk through a 100-year-old former meatpacking plant, dubbed “Hell’s Half-Acre.” Be on the lookout for bloody butchers and chainsaw-wielding maniacs scarily reminiscent of Leatherface, the nightmarish character from the famous movie based on a true story that took place in this very state. For 16 years, this multilevel freak factory has grown into one of the Southeast’s most popular Halloween attractions, racking up all kinds of awards in the process. There are two separate attractions: Banshee, named for the terrifying, eyeless monsters with ear-piercing shrieks, and Hive, a descent into a genetics experiment gone horrifyingly awry. 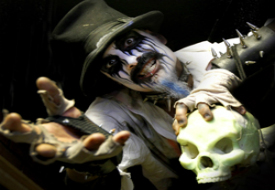 Netherworld offers discounts for both attractions, as well as reduced rates for military. While organizers try to keep lines within 30 minutes, avoid wait times by ordering tickets online and coming mid-week. Howl-O-Scream at Busch Gardens, Williamsburg, Va., and Orlando, Fla. While the Alone experience is only offered at the Orlando location, a new addition to the Williamsburg park is the “Root of All Evil” haunted house, based on some botany experiments in Germany gone terribly wrong.